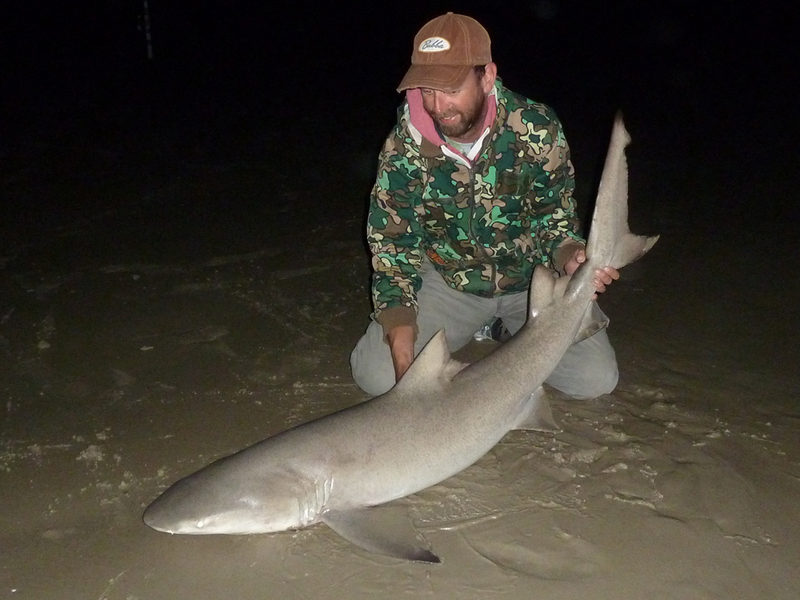 We had waited all day but finally the tide was right for a rematch with yesterday's lost lemon shark. Paulos and I were on the beach, fresh bait caught, rods cast - sat back waiting for that 28 foot twitch! And we waited. Two hours later we hadn't had a touch. On Paulos' advice I put a fresh mullet head on one of the red drum rods, chucked it out as far as I could and minutes later it was away. 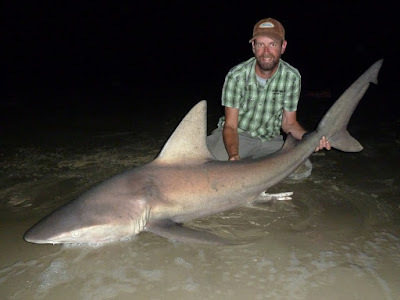 I could tell it was a shark as it peeled all the 25lb line off the reel and onto the backing, eventually working it back and a 5" 2' lemon shark was on the beach (below). Not as big as last nights lost fish, but that really didn't matter - delighted! And 25 minutes later Paulos grabbed a fairly fresh 6" 7' sandbar shark from the surf. One angry shark thrashed about being unhooked and smacked me round the head with its tail as we measured it - that will teach me to rush he fight! With a six footer landed on a night with only 3 runs we called it quits and headed home for some much needed sleep. Mission accomplished! Say the bells of St. Marg'ret's.